Is your team of four players ready to dive into adventure to solve new mysteries? Yes? Then give each player a Clue booklet and the matching Character tile. Seat yourselves around the table, preferably in the order shown to the right. Place one of the two Whisper tiles in the middle of the table (on any side) with The Yellow "M" on the first square. Choose a number from the back of the Case booklet. Open that booklet on the matching page and read out loud the introduction text. There are four difficulty levels: Beginner, Normal, Difficult, and Diabolical. 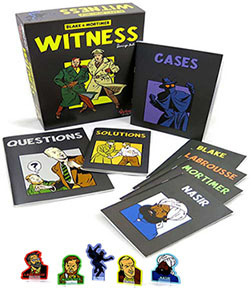 Then, each player secretly consults their clues on the page of the chosen case in their personal Clue booklet. You can re-read these clues and the case's introduction at any time. 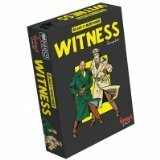 There are 4 rounds of whispers: the squares of the Whisper tile indicate on each round which players whisper their clues to the player next to them. Try to remember the clues you receive as best you can to pass them on efficiently to the other players! When you whisper, you must pass on your clues as well as all those you've received so far from the other players. Be careful: whisper so that the other two players don't hear you! When you receive clues, you cannot ask questions of the player whispering them to you (you can only ask them to repeat). Be careful: when you receive clues, you do not give out your own clues in return. Once the 4 rounds of whispering are done, secretly note what you remember. Nasir whispers his clues to Labrousse. At that same time, Mortimer whispers his clues to Blake. Then move TheYellow "M" onto square 2. 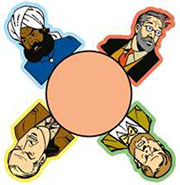 2) Labrousse whispers to Mortimer all of the clues he now knows (the clues from his Booklet as well as those Nasir whispered to him in the previous round). At that same time, Blake is also whispering to Nasir all of the clues he now knows. Then move The Yellow "M" onto square 3. Again, Nasir whispers all he knows to Labrousse, while Mortimer whispers all of his clues to Blake. Move The Yellow "M" to square 4 . Labrousse whispers all he now knows to Mortimer while Blake whispers all he knows to Nasir. Finally, move The Yellow "M" to the last space: you can now take notes! Open the Questions booklet to the page of the chosen case, then read out loud the three questions about that puzzle. After each question, each player secretly writes down their answer. Players are not allowed to communicate with one another. 12 points: Old fellow! You've reached perfection! 10 or 11 points: Goodness! You almost had it! 7 to 9points: Damn! Just a few small mistakes! 6 points or less: Devil! Share your clues and try the case again! A man of science as well as a man of action, Professor Mortimer has a knack for being at the right place at the right time to solve the most unbelievable cases. He's taken part in all adventures since the Secret of the Swordfish. Captain Blake is a field man, clever and determined, who works for MI5 (British secret services). 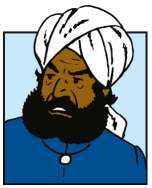 He's commonly involved in delicate diplomatic situations or espionage cases. A former agent of the Indian army, Nasir served under Blake's command during the Secret of the Swordfish. 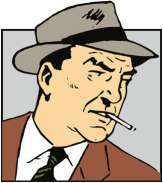 He then accompanies Blake and Mortimer in their adventures (The Mystery of the Great Pyramid and The Yellow 'M'). Discrete and observant by nature, Nasir also knows how to leap into action when needed. 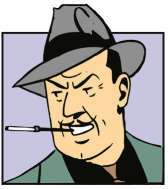 The Director of the French National Weather Services, Labrousse gives a hand to Blake and Mortimer during the S.O.S. Meteors case. His knowledge and his pragmatism have shown themselves to be the ace in the hole our heroes will use to solve their investigations. 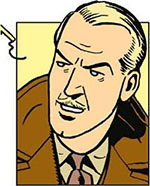 Colonel Olrik appears in the first adventure (The Secret of the Swordfish), and since then, he's opposed Blake and Mortimer on a regular basis. He's dangerous, devoid of scruples, Machiavellian, and has an incredible talent for fleeing when the situation turns against him. 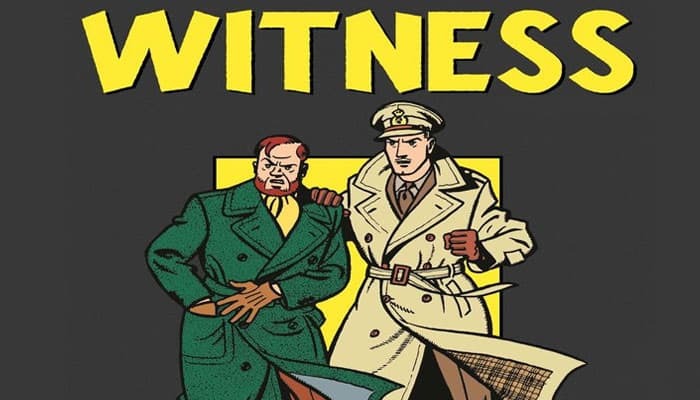 Throughout their cases, Blake and Mortimer have acquired a reputation that has allowed them to collaborate with authorities from all over the world. They share their adventures in England with ScotlandYard's Inspector Glenn Kendall (The Yellow 'M'), in France with Division Commissioner Pradier (S.O.S Meteors, The Affair of the Necklace), in Egypt with Commissioner Kamal (The Mystery of the Great Pyramid), and in Japan with Commissioner Hasumi (Professor Sato's Three Formulae).